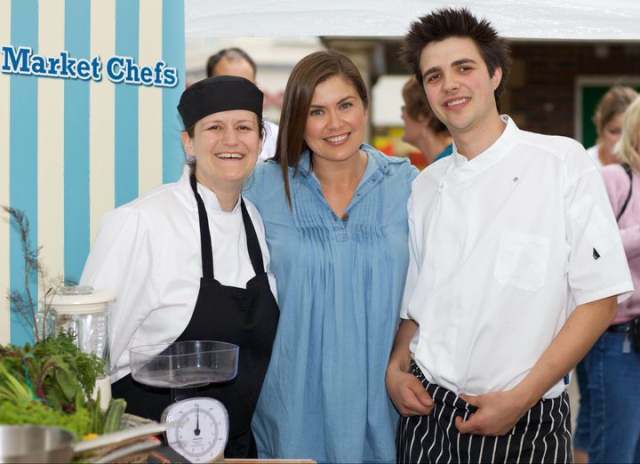 In this new Channel Five cookery show, presenter Amanda Lamb tours the UK’s towns, challenging a couple of local chefs to shop in the market and then cook a two-course meal with the produce in a head-to-head competition. The first in the series is set in York, and it’s my brother’s TV debut. Rob has been a chef since leaving school and is a regular demonstrator at food festivals and events around Yorkshire. If you’ve ever seen Rob cooking on stage, you’ll know that he’s made for this sort of thing. That’s Rob on the right, the one looking nervous because he’s stood next to the lovely Amanda Lamb. Try and catch it – it promises to be good. There’s more info on the Street Market Chefs facebook page. Well done Rob! I guess he has graduated from salad prep which was what he was doing when we met him – mind you that is a long time ago now!! You'll have to post a follow up Rich. Good luck Rob! Very cool, congrats to your brother Rob!